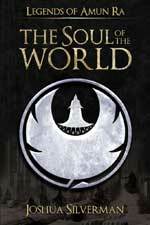 “The Soul of the World” picks up two years after Legends of Amun Ra The Emerald Tablet. The fight between good and evil in Potera rages on. An ancient power returns and a power struggle ensues. Who will win? The author, Joshua Silverman, gave me a copy of this novel in exchange for my review. Leoros is back and rather than tossing us into two years later with characters in a closet waiting for our return, Silverman has developed and grown his already strong cast. The writing style of The Soul of The World: Legends of Amun Ra – 2 is vastly improved from Legends of Amun Ra The Emerald Tablet which I thought a five-star novel (click here to read my review). Back stories and exposition are out of the way, so it’s time for action and Silverman writes action beautifully. From the moment we step into his world, there’s an urgency and complexity that will compel young readers to embrace the series and immerse themselves in the world of Leoros. There are books that are difficult to review without spoilers and The Soul of The World: Legends of Amun Ra – 2 is one of those books. Most moves in this novel are big moves that contribute to the forward momentum of the story. Despite the number of different points of view given in the story, the characters are easy to follow. The detail of the world that Silverman has created is quite consistent in this second outing. He was smart to keep the setting foreign and yet familiar. Much like children today picture the rolling hills of New Zealand as the setting for Lord of the Rings, Potera is easily pictured. The characters are all viciously real. No one is perfect. Silverman’s writing style is vivid and the violence, at points, might upset younger or sensitive readers. If your child read Harry Potter or other popular fantasy books of today they will not balk at the level of violence in the story. Atlantia is back and while the main character is Leoros, she is beautifully written. Early on she’s running through the forest and the economy of language which with Silverman describes her plight is stunning. She was a favorite character of mine in the first novel and remains so in The Soul of The World: Legends of Amun Ra – 2. Strong but not perfect and willing to do what she must Silverman doesn’t forget the value of appealing to girls as well as boys. Check out the review of the first book: Legends of Amun Ra 1: The Emerald Tablet by Joshua Silverman. This second installment in the Amun Ra series ends with a brilliant cliffhanger and I for one cannot wait to see what comes next. If you have a younger reader who loves fantasy, pick this series up for them. They will not be disappointed. For more information about Joshua Silverman, visit his website. You can connect with him on Goodreads, Facebook and Twitter @jg_silverman.